This bike should be at least a bit familiar to anyone visiting CSBFS. Take a look at the top of the page. See that sticker-encrusted bike above “Classic Sport Bikes For Sale”? 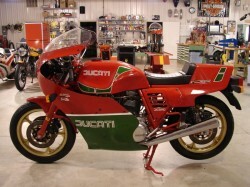 The silhouette should look similar to the bike shown here: it’s the Ducati race bike used by Mike “The Bike” Hailwood to win the 1978 Isle of Man TT. Stanley Michael Bailey Hailwood is considered to be one of the greatest motorcycle racers ever to turn a wheel. With a career in Grand Prix motorcycle racing and in Formula One, he’s also one of very few people to participate at the top level of competition in both disciplines. Between 1957 and 1968, he rode for both Honda and MV Agusta, winning multiple world titles in various Grand Prix classes. He retired from motorcycle racing in 1968 and raced cars in Formula One until 1974, when he was injured in a racing accident. In 1978, after 11 years away from competitive motorcycle racing, he returned to the Isle of Man TT where he managed a sensational win on what many considered an uncompetitive machine from a small, quirky manufacturer. The MHR bikes, designed to celebrate Mike Hailwood’s TT win, were really a cosmetic upgrade to the 900SS that had become a bit dated. 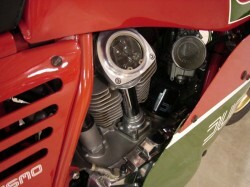 While Mike won on an 864cc race bike assembled on a shoestring budget by NCR, the heart of the bike shown here is the later square-case, desmo V-Twin (or “L-Twin” if you want to get picky) bored out a bit to earn the “Mille” moniker. 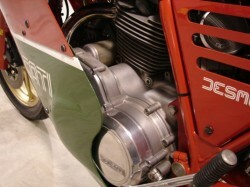 Up for auction is a 1985 Ducati Hailwood Replica Mille. This is a very clean motorcycle that I am selling for my Dad who is selling his collection. He is the second owner of this one and it has 924 Kilometers (574 Miles) on the odometer. This is the exact bike pictured on page 121 in Ian Falloons book titled “Original Ducati Sport & Super Sport”. The condition is fantastic and does come with a free and clear title. 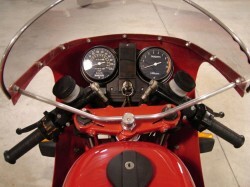 Also note the sight-glass on the rear cylinder. 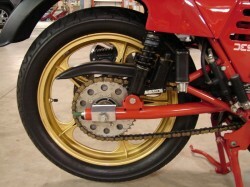 I actually want to own a bevel-drive Ducati just so I can install one of these: it lets you see the spring-less desmodromic valvetrain in all its glory. The “Buy It Now” price is set at $24k and there are still a few days to snap this bike up. A classic race replica with the looks of a competition machine and proven mechanicals, these represent a very rideable investment. I know the guy that has or had this MHR Mille for sale. I have one too. His has 924 km, mine has 4909 km and has been covered in my shop for years. I’m the original owner and can’t remember when I last rode it. I’m going to clean it up and sell it soon. The 2 into 1 exhaust was an option from Ducati. 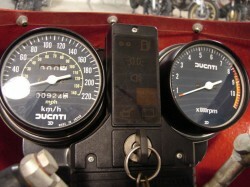 Conti’s were not listed by Ducati, but they were available. I have a set in addition to the Silentiums (heavy and too quiet) that came standard. The sight glass is called a ‘Gear Gazer’, used to be made by a Ducati guy down by Chicago, but I think lots of others make them these days. I have one on my Mille – the only non-original piece on the bike, but I just had to have one. That Gear Gazer gets more attention than any thing else on the bike. Previous story 1954 MV Agusta 125 TR in Colorado!